John lives and works on the Devon / Cornwall border at Henford, Ashwater, where he shares a small farm with his family. The farm, the brooks and the local rolling landscape provide inspiration for his loose watercolours and charcoal sketches, and being a keen surfer he finds watercolour particularly well suited to convey the power of the crashing surf and the occasional tranquillity of the Atlantic coastline. 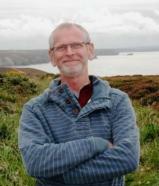 He is an exhibiting member of the St. Ives Society of Artists, and has published works for a variety of artists’ magazines. He hosts demonstrations and workshops both at his studio and for art societies throughout the west-country.